Ductless air conditioning units (or, mini-split units) provide an excellent temperature control solution to any home or business. They are versatile, low maintenance and provide superior control and comfort. Ductless systems are not always the best option, but when it comes to handling the needs of one or two rooms, or when a fully ducted system is not a viable option, mini-split ductless systems are ideal. Contact ComfortMaster, to help identify the best option for you home, or business. Over the years, our exceptional service and top-class specialists have garnered the respect of the entire Hudson Valley area. Take a look at some kind words from our past clients if you’re not convinced! 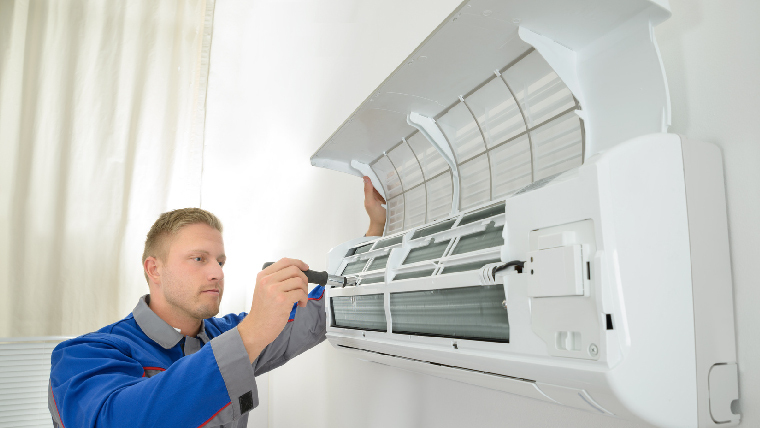 Whether you need a simple fix, or a major overhaul, Contact the professionals at ComfortMaster now at 845-666-0090 to find out about our 100% guaranteed ductless AC repair. Water leaking from the indoor unit. If you notice water on your walls or floor, you likely need some repair. Generates excessive heat beyond that of normal operation (a running unit is warm to the touch near the motor, but not hot!). Unwarranted noises. Ductless units are very quiet, so any squealing or clanking may indicate a problem with the fan or belts. Aside from it just plain getting old, there are a few fairly common causes for failure in a ductless unit. Comfort Master is ready and equipped to handle any and all of them, whether common or complex. Dirty or clogged air filters, coil, or fan wheels can dramatically reduce the quality of air cycled by your air conditioner. It can also make your system work harder and perform less. Clogged condensate draining is one of the most common issues with a ductless unit. As your unit pulls moisture from the air, the condensation that forms drains off into a specified location. If this system becomes blocked, or breaks, it can lead to unwanted damage from water leaks. Inadequate refrigerant is a fairly standard problem, causing your unit to blow tepid air that cannot properly cool your home. Inaccurate thermostat readings can lead to some particularly frustrating operation issues, and may only require a recalibration. Our techs can have that fixed in a hurry. Don’t be caught in the summer heat this season without a properly maintained air conditioner. Let the experts at ComfortMaster handle all of your maintenance and repair needs! We bring years of experience, top of the line technology and impeccable customer service to your doorstep. Our techs are available 24/7 and are ready and waiting to meet your every air conditioning need. Give us a ring at 845-265-6500, or contact us online!